Apologies for covering old ground here. I wrote about the endoscopy experience about a year ago when I had the last one. Subconsciously this particular procedure, or rather what the results might show, had been causing me a few concerns so I was keen to get on with it. I needed to know if any new varices had grown over the last 12 months. 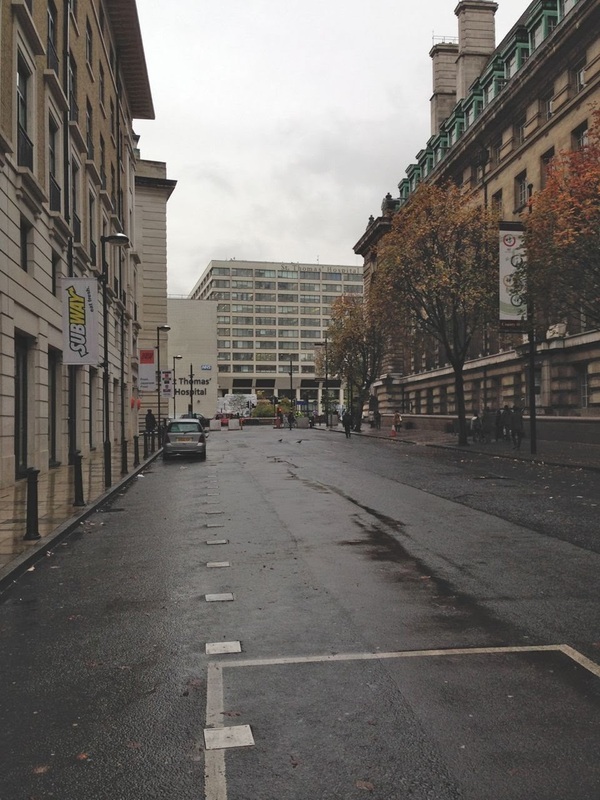 We got to Waterloo station at nine and then had a ten minute walk, through the drizzle, to get to the hospital, passing County Hall on the right and a number of cafes on the left. The smell of breakfast wafting out of their doorways just helped to remind me that I hadn't been allowed to eat anything that morning. We made our way up to the first floor and found the new Endoscopy Suite which opened in May this year. It looks north across the River Thames and the Houses of Parliament, a view I became used to when recovering from my last operation in June 2011. It's always worthwhile arriving a bit early, especially if you are one of the first appointments of the day. After a few minutes one of the nurses came to collect me. I recognised her from my previous endoscopies. She quickly ran through my medical history and medications and asked me if I wanted sedation. "Yes. Definitely". I then had to sign a consent form. She then announced that I would be first into the procedure room. 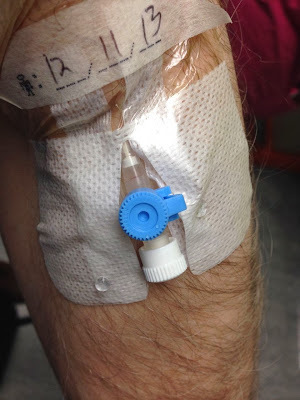 Wristband attached, cannula inserted, ready to go. Another nurse appeared to see if I was ready for the doctor. I said goodbye to my wife who was told I should be ready for "collection" in two hours time. Immediately the doctor appeared, asked me if I was aware of what the procedure involved, explained that the risk of something going wrong was 1 in 10,000 and got me to sign another consent form. 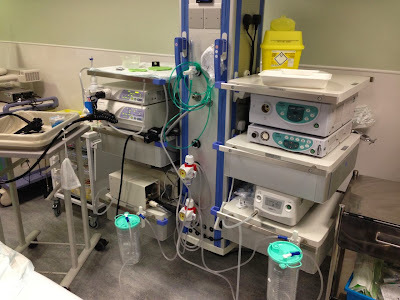 A few seconds later I was shown into the procedure room at which point I was sad enough to ask if I might take a picture of the equipment for this blog. It was then onto the bed and an oxygen supply inserted into my nostrils. I don't know what it is about the oxygen but I really find it unpleasant. I suppose it reminds of other times when I've really needed to be connected up, not just as a precaution. The doctor asked me if I had any questions. I replied that I had one request - that the gag/camera guide which goes between your teeth would be put in after I had had the sedative introduced. Of all the tests I have been through over the years the bit I dislike the most is the gag. Next I was given a few squirts of xylocaine spray to the back of the throat. It's a local anesthetic that tastes of burnt bananas and comes a close second to the gag in my list of unpleasant procedure experiences. Just thinking about it now is making my stomach turn. The next thing I remember was waking up in Recovery with a nurse asking me how I felt and telling me the good news that I didn't need any banding. This was doubly good news as it meant I could have a coffee and biscuits straight away. She gave me a copy of the Endoscopy Report to read. Three short varices had been found but they did not warrant any banding. Unfortunately the report had no pictures but did say that I didn't need a follow-up camera job for 12 months. First task - produce the list of questions to discuss. I've changed my mind about keeping the list on my 'phone, much better to print out a copy, then you can write the responses on it. I've written this down whilst it is still fresh in my mind. Apologies for it being a bit wordy. Eventually I will get to editing it down to the key points. Arrived early and weighed in - 3kg lighter than the last visit - the diet is starting to work. Asked the nurse to put a label on my notes that I wanted to see my usual doctor. This approach has its pros and cons. On the plus side you get the continuity of seeing the same doctor each time. The down side is you are likely to have to wait longer before you are seen. That's exactly what happened. Patients who had no preference as to which doctor they saw were waiting 5 or 10 minutes whereas for me it was closer to an hour but it was my choice and I knew the consequences. 1) Calprotectin test results? He called my file up on screen. 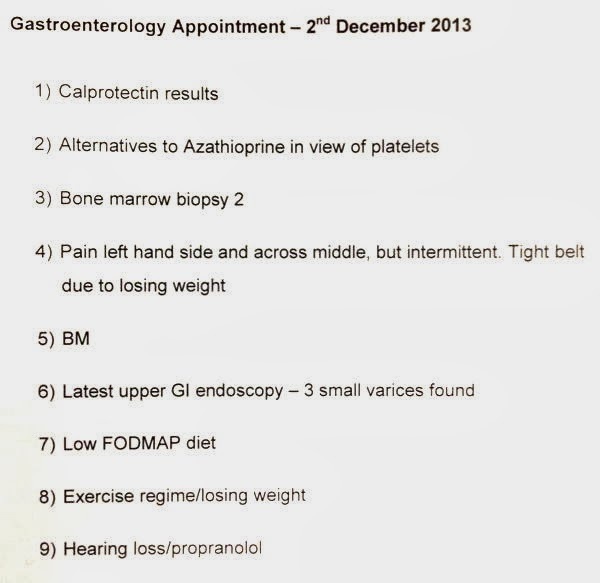 Result - 59 - top end of normal, but it is normal, and suggests that the Crohn's is still inactive. I wasn't expecting that as it seemed it might be starting up again. He mentioned a recent study which had correlated calprotectin results with subsequent colonoscopy observations. The calprotectin had been shown to accurately predict what a colonoscopy then showed. 2) Alternative to Azathioprine? The recent bone marrow biopsy results appeared to show that my low platelet problem was a result of Crohn's + long term Azathioprine. Was there an alternative drug when the time came? Yes, plenty of other drugs ranging from Methotrexate to the biologics such as Remicade (Infliximab). I commented that I had tried Remicade in the past but it didn't seem to work for me. He noted that the circumstances were a lot different now that I had had the operation in October 2010. I asked if the plan would be to start medication to maintain remission or to continue without until I noticed the Crohn's starting up again. He replied his aim was to monitor for the "signs" of Crohn's not the "symptoms" ie. identifying that the Crohn's was becoming active and treating it before the symptoms appeared. Sounds like a good approach. The monitoring would comprise of 6 monthly calprotectin tests and backed up by colonoscopies or capsule endoscopies as required. 3) Bone Marrow Biopsy. I would be back at Guy's the following Monday for another bone marrow biopsy to redo the aspirate slides. He was unaware of this and looked at my file again. "Ah! That's why. I haven't got a copy of the follow-up letter from your last haematology appointment." Now there's a surprise. I explained that, a few months back, I had had to email to the head of that department to get four previous follow-up letters produced. He asked me if I was OK about having another biopsy as it was the one test he really wouldn't want to undergo himself! Fuuny, that's been the reaction of most people who've heard I'm having one. Once the local anaesthetic has been injected you don't feel much else. 4) Anastomosis pain. When we've discussed this before he concluded it was purely mechanical ie. given the amount of surgery carried out there could well be some adhesions or scaring formed. He examined my abdomen and could feel a small amount of scar tissue. Nothing to worry about but he gave me the option of an MRI scan if it would put my mind at rest. I had already said that I've got to the point of being thoroughly fed up with endless appointments so we agreed that the decision should be put off until the results of the next calprotectin test in six months time. 5) BM. Not something I particularly like discussing so we'll leave the detail in the consulting room. He did however say that after the surgery I had had he wouldn't expect my digestive system to behave normally. I'm taking 2 capsules of Loperamide per day and then sometimes an extra one if I'm going out somewhere. He felt this was the right approach/quantity and mentioned that there are some alternative drugs that I might want to try. (Unfortunately I can't remember any of the names). 6) Upper GI endoscopy. The scope showed 3 small varices but not large enough to need banding. Next endoscopy set for twelve months. He couldn't remember if I was still under the care of the liver specialist. I replied that I had been discharged after my last appointment as the suspected PSC was in its early stages. I asked how that condition should be monitored? Regular blood tests that could coincide with the Calprotectin tests. 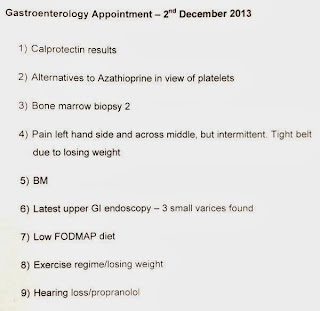 7) Low FODMAP diet. I have started following this diet, in particular avoiding the likes of onions/onion powder, garlic/garlic powder and apples. It seemed to be helping by reducing bloating etc. I was toying with the idea of trying to go Gluten free and/or Lactose free. He stressed it is not necessary to go overboard with this diet. You can choose which parts to follow. It is a tool to improve your quality of life, not something that affects the Crohn's itself. If I wanted to go out for a curry one night and ignore the diet then fine, do so. It wouldn't have a lasting affect but just be aware that you might feel uncomfortable afterwards. 8) Exercise regime. Mentioned this in passing. He was happy to see planned weight loss, it was the unplanned variety that worried him with Crohn's. 9) Hearing Loss. A bit of a long shot but I have noticed recently that my hearing is impaired, enough to have a hearing test done last week. The test showed that certain frequencies are affected. One of the questions the audiologist asked was do I have low blood pressure. Because of the PVT/PSC I now take Propranolol to reduce my blood pressure so I wondered if there might be a connection.